Have you ever wanted to try riding at night, but are reluctant to invest in lighting? Come to this special event and learn what you need to know to safely ride your bike during cool evenings & nights, instead of the heat of the day. Club Secretary Bob McHenry will present a short talk about bicycle lighting and night time riding safety. Cygolite, an Orange County bicycle lighting systems manufacturer and a BCI club sponsor, will present an overview of their product line & provide loaners to demonstrate their products. Then we’ll mount lighting on members’ bikes, and we will do a no-drop fun ride of about 20 miles at an easy pace with a dinner stop. Cygolite has generously offered to raffle some lighting at the end of this ride! Note: If your bicycle does not have pedal and spoke reflectors, BCI recommends purchasing an inexpensive set of reflective ankle straps for the event. They can be purchased at most bicycle shops for $5-10 per pair. California Vehicle Code requirements, and other recommendations and suggestions for riding safely at night will be discussed at the event. 13 mile ride around Irvine - 95% on paved off street bike paths ! 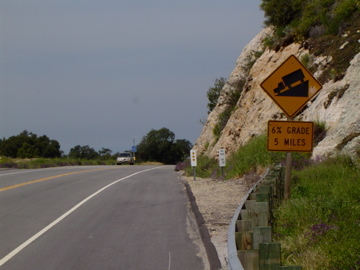 Many people enjoy riding, but prefer to stay off the roads as much as possible. This ride is for you! 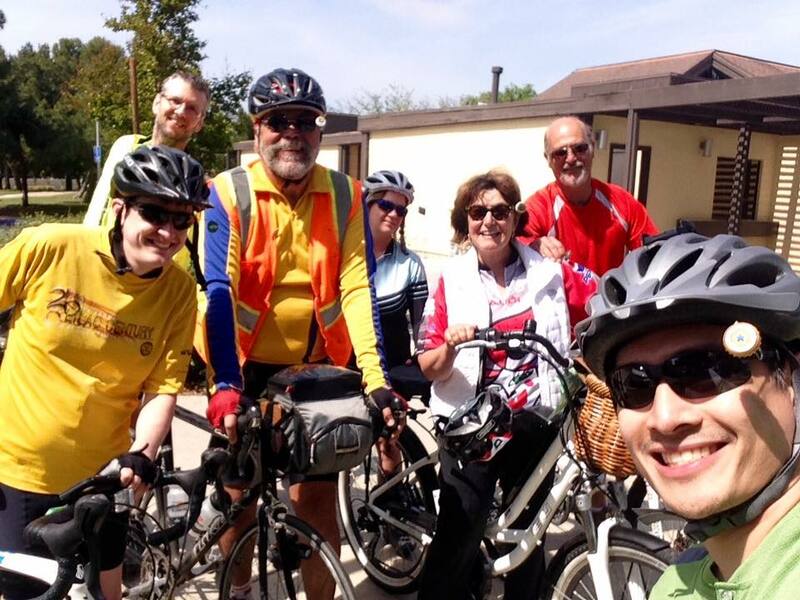 We will ride the Walnut, Peters Canyon, Hicks Canyon, Jeffrey Open Space and Cypress Village trails. Invite friends, neighbors, significant others, meet new friends. This is a NO DROP ride, we will regroup along the way so no one is left behind. Almost any type of bike is suitable. Helmets are strongly recommended and required by law for minors. We roll at 5:30 pm. Sunset is at 7:36 pm, so there is plenty of time to get back before dark. We will schedule more of these rides over the summer if there is enough interest. Lets do lunch after the ride! 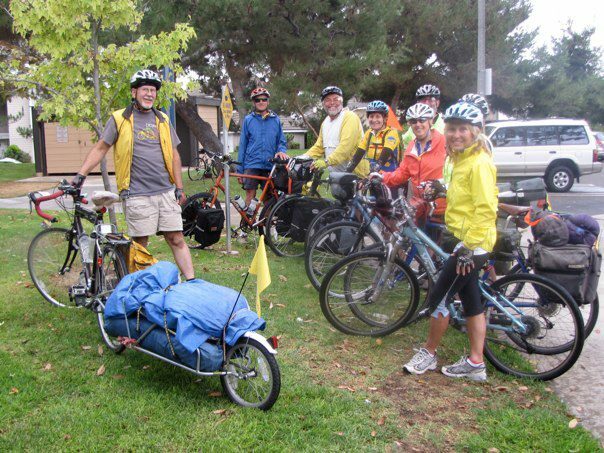 No registration & FREE – but do email Bill@BikeIrvine.org so he has an idea of how many are coming! BCI Members who are willing to coach & role model good bicycle driving are welcome to help out… Cycle of Safety members especially welcome! The first Saturday is Jersey Day and the one day we all wear BCI jerseys if you have them. Current and past versions of the BCI jerseys are on display! After the ride we meet for lunch. There are a number of food outlets and plenty of shaded places to sit outside. If you don't yet have a BCI jersey - see ordering info here! The first Saturday is Jersey Day and the one day we all wear BCI jerseys if you have them. Current and past versions of the BCI jerseys are on display! See the United States or the World from the seat of your bike. 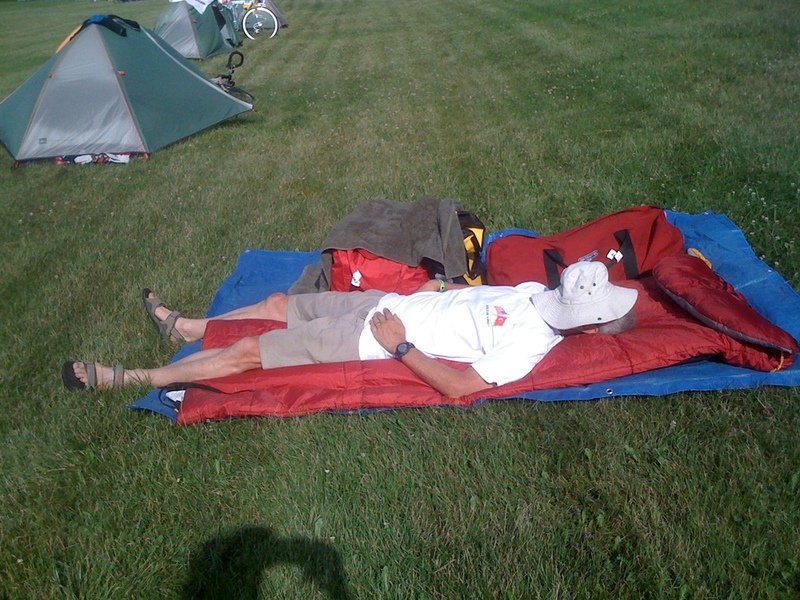 Richard Sheff will talk about the joy’s of ‘credit card camping’ with clean beds & meals served. He is experienced in pulling together small group tours, lodging, and ‘sagging’ you luggage to keep your road bike light. 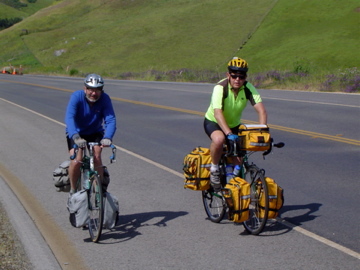 Ride Coordinator Norm Moyer, along with Doug Peterson will share the adventure and preparation of taking everything with you on a fully loaded self contained tour. Norm challenged us to expand our comfort zone - He and BCI Club members Patty & John Hoskins & Richard Vallens plan to pull out on a train to Fontana latter this week to start riding east on HWY 66 for several weeks! Sharing good times & cooking outdoors! Norm challenged us to expand our comfort zone - He and BCI Club members Patty & John Hoskins & Richard Vallens plan to pull out on a train to Fontana latter this week to start riding east on HWY 66 ... for several weeks! 3: Camping does not have to be uncomfortable - if a truck is hauling some of your gear, chairs are nice! 8: Do enjoy the world as no one in a vehicle can. Secretary Bob McHenry showed some of his economical modifications to an old hard tale ATB that is now his touring bike. We hope you JOINED US FOR GREAT STORIES AND EXPERIENCED ADVICE. Next Meeting is June 28th! Please join us at the food court below Barnes & Noble – Members may bring a bottle of wine to share or perhaps some cheese and crackers. We always find good things to chat and laugh about. There are also several choices where we can pick up a little dinner. Everyone is welcome to drop by - no bicycles required. Slide show - click to see more photos! We start with a quick instructional class where we discuss safety, equipment, driving your bike like an adult, riding in a group, safety checking your bike before rides, and review rules of the road. We will see how the regular Saturday BCI ride rolls out, and then we will do our ABC Quick Check & roll out in our own group. It's a “no drop” ride, which means that we will stay together and will periodically regroup all riders back together, so no one is left behind. Our slowest rider will set our group average speed. 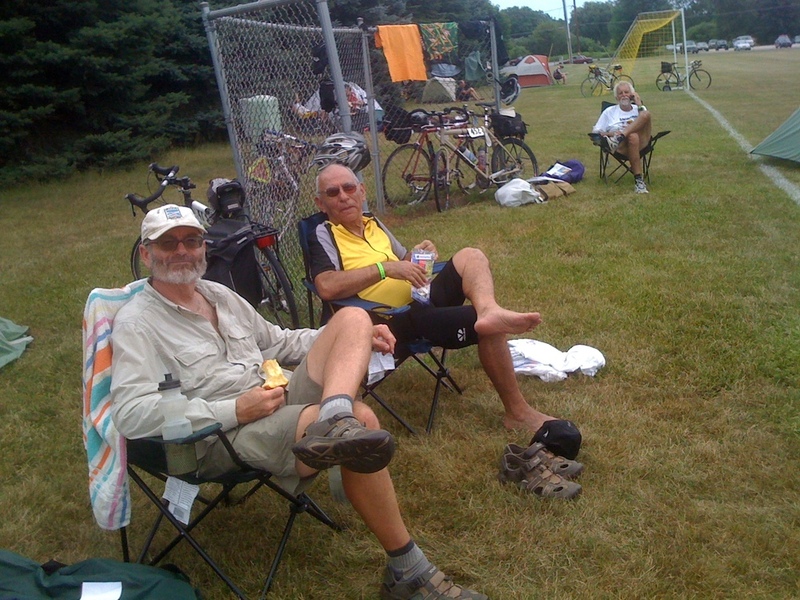 About half way into the ride we will enjoy the rest stop with all of the long ride, medium ride and short ride BCI riders for a snack and a chance to socialize. If the distance scares you, think of it this way: we really are doing two very short rides, to and from a break, and that’s easy! BCI is a recreational, social, non-racing club. An important aspect of our NewB Ride is the new friends you will meet; other NewBs, as well as some experienced members who help out as coaches. Riding with a friend is much more enjoyable! Class begins at 8:00 a.m. The ride begins a bit after 9:30 a.m. and returns around 12:30. Guests are welcome and encouraged! Non-members are required to sign a BCI Guest Waiver. Helmets are strongly recommended and usually worn by all. Most riders wear gloves and some eye protection. 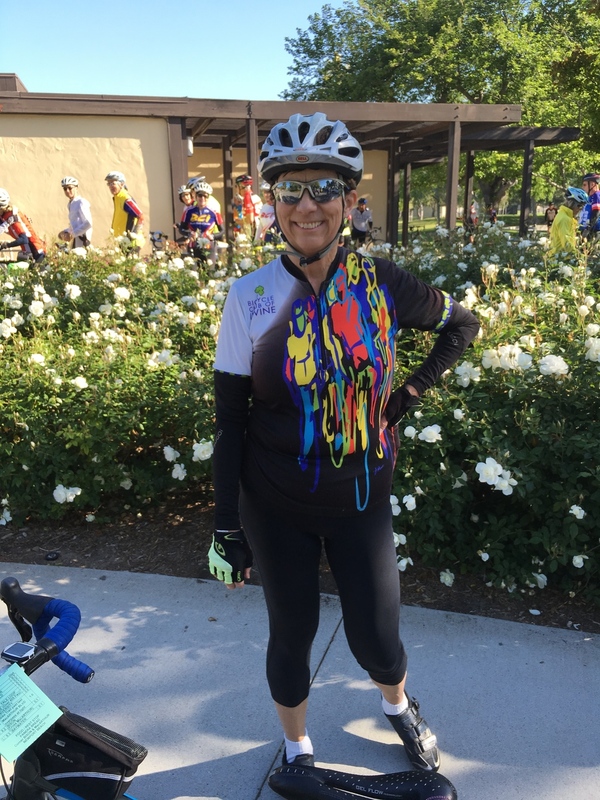 Cycling shorts are more comfortable & bright colored shirts/jackets make you more visible to others on the road; For hydration, carry water… and a little cash for a well-earned snack & cup of coffee at the regroup stop! Any bike in riding condition will do - but most ride thin tires because it’s a lot more work with big tires! What a great ride! Beautiful weather & chance for 13 participants to meet & ride & share dinner. Cygolite reps Andrew & Eric even had a raffle - 2 Hot Shot Micro tail lights were won by Dev Sellin & Rick Collins; A Dart 200 headlamp was won by Rob Tinkham; 2 Dash 320 head lamps were won by April Alverez & Nancy Collins, and the very cool & much coveted Hot Rod tail light was won by Karen Wendel. 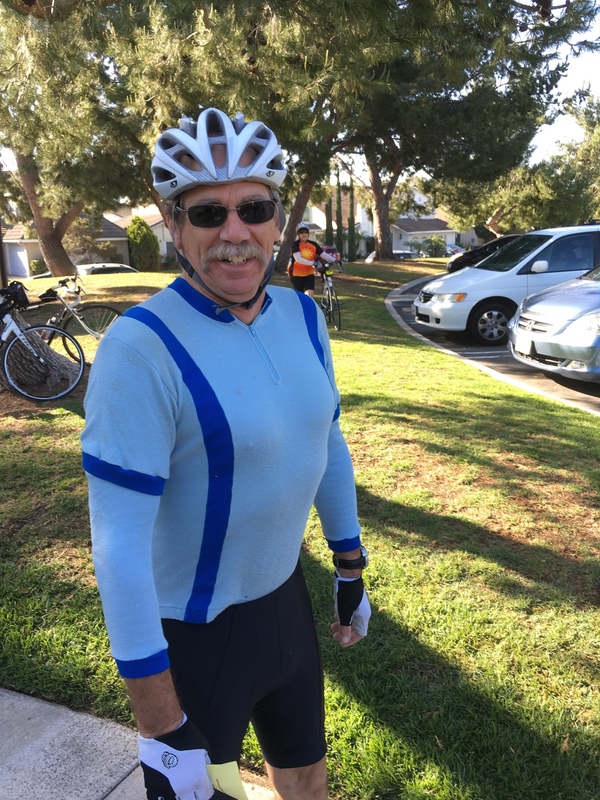 Club Secretary Bob McHenry will present a short talk about bicycle lighting and night time riding safety. Cygolite, an Orange County bicycle lighting systems manufacturer and a BCI club sponsor, will present an overview of their product line & provide loaners to demonstrate their products. Then we’ll mount lighting on members’ bikes, and have a no-drop fun ride of about 17 miles at an easy pace with a dinner stop. Cygolite can outfit 20 riders with lights to try out night riding. No sales pitch or direct sales at this event, just good information and night time riding fun. If you already have lighting for your bicycle, you are welcome & encouraged to participate in these events too. A light jacket will help when we stop for dinner & if the evening is cool. Reminder: The California Vehicle Code requires every bicycle ridden after dusk to have a white head lamp, red rear reflector or tail light, pedal/ankle or shoe reflectors & side reflectors (typically each wheel or reflective side wall tires). Inexpensive reflective ankle straps will cover the required side & pedal movement. Requirements, recommendations, and other suggestions for riding safely at night will be discussed at the event. A selection of BCI jerseys on display! Slide Show - click to see photos taken at lunch! Guest Speaker / Program: TWO! and access the BCI Roster. This is a hands-on class so bring your bikes. Kristen Lawrence from Pure Rides Cycles will lead us in a bike clinic featuring general care and feeding of your bike. This will also cover basic road side repair issues such as chains falling off, brakes rubbing and derailleur adjustments. thanks to our outgoing 2015 Director of Hospitality Beth Sher and newly appointed Director of Hospitality Suzanne McCord. The Board of Directors meets on the 4th Thursday every month to handle the business of the club. The Board has appointed Suzanne McCord to Director of Hospitality, so now the team is complete. Quorum of 9 of 11 Directors were present. Absent: Director @ Large Profetta and Ride Coordinator Moyer. 1 Member; Rick Levin attended.